Does Floortime Therapy Work? We're still waiting for the evidence. I’ve been reading about Floortime/DIR Autism Therapy for the last twenty years and have also written about this topic at length before. The theory behind this form of “play” therapy always sounded compelling because it appears to mesh well with a very nurturant style of child-rearing. Unfortunately, during the last two decades, there has been very little in the way of scientific testing to support the purported efficacy of this method. Although there have been many dozens of uncontrolled studies, Floortime Therapy has never been subjected to the rigor of science, much to the frustration of adherents to the scientific method. Finally, in 2011, there was an attempt to add scientific rigor to the testing of Floortime autism treatment. Recently, the Canadian Broadcasting Corporation (CBC) showcased Floortime Therapy and the purported science supporting the therapy. I watched with great interest as a professor from York University was interviewed regarding this so-called “break through” in autism treatment. I took down the name of the researcher and started to look for the peer-reviewed journal article created by this researcher from a legitimate university. I couldn’t find a 2012 study, so I wrote to the research center and they kindly sent me the latest article, which was actually a 2011 article that I had already read. In the 2011 study I received, there was no report of the brain scans that were highlighted in the CBC news clip. When I contacted the research center, I was told that the information on the brain scans had not yet been published. Since there has been so much publicity regarding this latest article, I’ve decided to present a short analysis on the 2011 Floortime study conducted by Casenhiser, Shanker and Stieben. They recruit fifty-one children for their study, which is a relatively large number in autism research. There are two groups of children (an experimental and control group). They attempt to randomly assign children so that both groups would be similar prior to the treatment being administered. The authors very honestly describe the limitations of the study, instead of attempting to hide them (which is so often the case in autism treatment research). The control group receives a large number of different treatments in a completely uncontrolled fashion. The experimental group receives more hours of treatment than the control group (which is, in my view, a fatal flaw since the variable “intensity” is not controlled). There is no I.Q. testing conducted prior to and after the study. I define this as a major flaw since it is crucial to understand whether or not treatment would affect the cognitive skills of a child with a developmental delay or disorder. The researchers in the Learning Through Interaction in Children with Autism 2011 study use the wrong control group; they need to compare Floortime with a control group that is receiving what is considered “best practices” for autism, which is currently Intensive Behavioral Treatment. In this study, children were not diagnosed with autism by a specific psychologist with expertise in autism. Researchers rely on diagnoses made prior to the study from a heterogeneous group of clinicians. This is a severe flaw because we do not know the quality and accuracy of those diagnoses. Since autism is a spectrum disorder, one clinician’s Asperger Syndrome diagnosis may be equal to another clinician’s Autism diagnosis. Tools used to measure improvements in the study were developed by the original proponents of the therapy. Using subjective measures to indicate whether a treatment is successful is forbidden in science. The tools used to discern improvement must be independently developed and tested prior to their use in an experiment. There was only one objective measure developed from the field of Speech and Language Pathology. There must be more objective measures in general, and from the area of Speech and Language specifically (and even this one objective measure did not yield a difference between the experimental and control group). Due to an attrition rate of 43% of the children from the study, we have no way of knowing whether the more severe children left the study to be provided Intensive Behavioral Treatment. It has been my observation over the years that parents of children whose autism is more severe tend to gravitate towards programs that are highly behavioral in nature, since such programs tend to provide better results more quickly. Did the abandonment of the Floortime study by these parents result in a biased group of mildly affected children remaining in the Floortime study? We don’t know; however, we do know that this study has so many limitations that it provides no evidence whatsoever that Floortime Therapy is effective. The fact that almost half of the subjects at the beginning of the study were not there at the end, should disqualify the entire effort for any serious scientist or public policy official. Bottom Line: Based on the studies that have been conducted to this point on Floortime, there is no evidence to suggest that Floortime is an effective treatment for autism. We eagerly await the solid evidence! 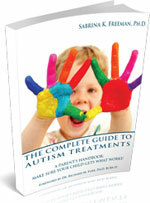 Parents have a very difficult time negotiating the world of autism treatments. Everyone is out there offering the latest treatment for the disability of autism. This is nothing new, and until there is actually a cure for autism, various forms of autism snake oil will continue to be sold through the unreliable, age old testimonial. What’s different now is that the researchers have upped the ante. They now have a well-funded, well-heeled autism organization provide legitimacy to propagate autism treatment myth. The organization I’m referring to is Autism Speaks. The last thing we need is for Autism Speaks, and the scientists who work under their umbrella, to be associated in any way with autism treatment quackery. Today, there was yet another feel good testimonial on the Autism Speaks Official Blog espousing the virtues of Floortime. This testimonial is the product of training from a $15,000 grant provided by Autism Speaks! I’m floored! Here are researchers, using a technique with no scientific evidence, receiving big money to train an army of therapists, teachers and respite providers across twenty-two states. Now the first kids to graduate from this program are being presented as success stories. Prior to giving money to train people in a technique that has no scientific evidence, it is incumbent upon Autism Speaks to support well-designed research into the experimental treatment known as Floortime, to discern whether or not the treatment actually improves the condition of autism as compared to other treatments that are currently considered best practices. I would like to say this to Dr. Geraldine Dawson, Chief Science Officer, Autism Speaks: you should know better! It does no service for children with autism, and the parents who advocate for them, for a leading autism organization to misinform about the efficacy of treatments; yet this is exactly what Autism Speaks is doing in this instance. By promoting and propagating quackery, Autism Speaks dilutes its legitimacy. In my view, this is shameful. Autism Speaks has enormous potential to change the lives of children with autism, if only they were to use that power responsibly.